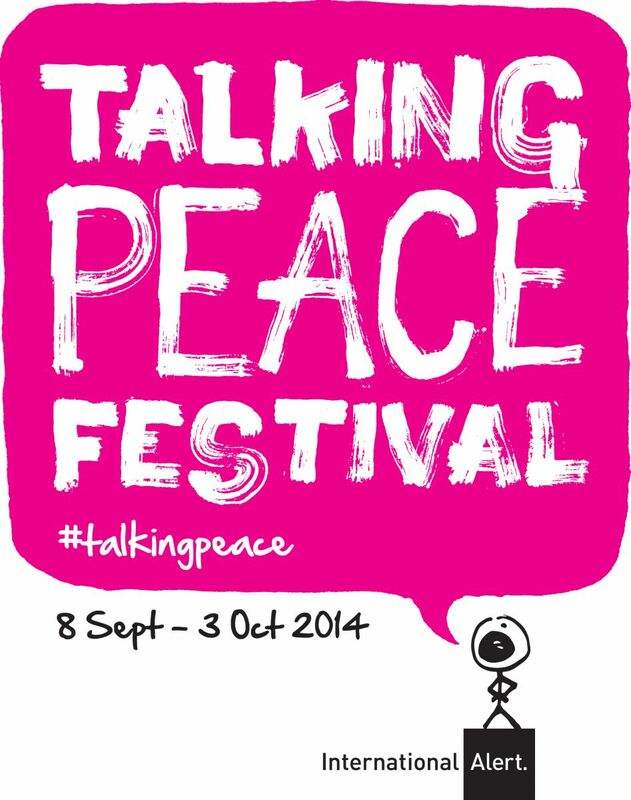 From our friends at International Alert – the expanding Talking Peace Festival this year . . .
“The Talking Peace Festival is a series of events taking place this autumn around International Peace Day on 21 September. Using the universal language of creativity, the festival will illustrate the importance of dialogue in resolving conflicts in venues across London. Join us for talks, comedy, art, food, photography and more! Strike a pose for peace in our Peace Photo Booth and enjoy live art demonstrations as part of our #Art4peace campaign. Free. #Art4peace campaign, various locations throughout September. Talented street artists unite in painting campaign for peace in spaces around East London. They will include: Benjamin Murphy, Dan Kitchener, David Walker, Faunagraphic, Fipsi Seilern (Pang), Francesca McHugh (Love Artist), Ibrahim Fakhri, Jim McElvaney, Joel Bergner, Lana Hughes (Lana Alana), Magnus Gjoen, Mr Dane, Paul Curtis (Moose), Pure Evil, Suzko and Tarek Tuma. Come and see this iconic Shoreditch mural transform into a giant piece of street art – for peace! Free. Photography from award-winning photojournalist Carol Allen-Storey, featuring the stories of young Rwandans, their reflections on the genocide and hopes for the future. Free. A pop-up grill serving dishes from the Middle East over the weekend of International Peace Day. With recipes from renowned chefs Anissa Helou, Yotam Ottolenghi and Claudia Roden. Our annual benefit comedy night featuring Rich Hall, Stewart Francis, Holly Walsh, Matt Rees, Daniel Simonsen, Nick Revell and Alistair Barrie (MC). Exhibitions, talks, workshops and more! The highly acclaimed satirical panel show presents an International Alert special, chaired by LBC Radio’s James O’Brien. Heads up on a timely event on Monday 15 September – a peace-building conference at St Ethelburga’s Centre for Reconciliation & Peace, London to mark the UN International Day of Peace. Lord Michael Bates sets off on his Walk for Peace on 4 August. He is walking 1,000 miles from London to Berlin to raise funds for medical care for child victims of war. A patron of the London Peace Network and a vigorous promoter of the Olympic Truce and non-violence, he walked from London to Olympia in 2011-12 and in aid of the children of Syria last year. This year, his route reminds us of the horrific C20th conflicts which started in Europe and what happens when we are unable to resolve our differences without resorting to violence. The walk is also raising awareness of the innocent victims of current conflict – children. Sponsorship for the walk is going to Peace Village International, a German charity which helps children in areas of war and crisis. Follow Lord Bates on twitter @BatesLord, keep him going with messages of goodwill and encouragement, sponsor the walk and follow his progress on his Walk for Peace blog as he starts out from Westminster Abbey on 4th August after the “lights out” ceremony – a solemn commemoration of Britain declaring war in 1914. He arrives in Berlin on 2nd October, the UN International Day of Non-Violence. Peace flyers for 19, 20, 21 September! Peace flyers for Islamic centres, synagogues, churches and meeting houses are now ready! Click on the images below to download the flyers. Send links to friends, colleagues, neighbours and networks, encouraging them to open up their places of worship, inviting in neighbouring communities and visitors during peace weekend. Flyer for synagogues and Jewish centres. Flyer for churches, Meeting Houses and Christian centres. We are delighted that the Quakers have added their support this year, and that Religions for Peace UK are also encouraging their members to get involved. Islamic centres will be receiving visitors on Friday 19 September, synagogues on Saturday 20 September and churches and Meeting Houses on Sunday 21 September. Everyone participating will be part of a world wide weekend of action for peace-making, truce, reconciliation, mediation, ceasefire and a celebration of peace-building. If you have any questions or would like to know more, please contact the people listed on the flyers or the London Peace Network.